If you want to visit the beautiful city of Puntarenas, here we will provide important information that will help you enjoy this area. Puntarenas is the largest and most populous city in the Pacific coast in Costa Rica, and is located on a spit of land that gives rise to its name, this town is located just 1 hour and 40 minutes from San José (capital Costa Rica) Puntarenas Tourists will find a beach with calm and clear waters, ideal for water sports and enjoy the sun; this area also offers all kinds of services for the Tourist, you will have access to all amenities, such as restaurants, tour operators, shops, health clinics both private and public like Monseñor Sanabria Hospital located in Puntarenas down town; in addition to an excellent banking and communication system. It is also important to mention that the area has a Costa Rican Tourism Institute (ICT) office, located in the Paseo de los Turistas; this office will give you more details about the area. The Central Pacific of Costa Rica is one of the most important Tourist destination of the country; the city of Puntarenas has great attractions, where you will learn and enjoy part of our history, customs and all that this beautiful region has. The official company providing public transportation service from San José to Puntarenas one way or round trip is Empresarios Unidos de Puntarenas. This bus station is located in San José, on 16th Street and 12th Avenue. It is important to remember to buy your ticket in advance. This beach is about 3 km long, is a dark sand beach, where you can have fun doing activities such as fishing, snorkeling, boat, kayak and water banana tours; you can also relax and take a sunbath or just enjoy the sea. In La Punta, there is the lighthouse and the piers that serve as observatory for visitors; from this point you can admire the Nicoya Gulf. There is vegetation along the coast, mainly coconut palms and tropical almond trees. Popularly known as the Paseo de los Turistas, this is a boulevard for people and vehicles, located along the main beach in Puntarenas. In this boulevard you can find numerous shops, restaurants, bars, hotels, souvenir shops, ice cream parlors, and areas for skating and walking. Here you can enjoy very friendly people, and you can also appreciate many typical dishes, such as "The Vigorón" and "Churchill". These are two important typical dishes of the area; if you are seafood lover, in this area you can always find fresh seafood. Muelle Grande is the main pier of Puntarenas, and was built in 1928. It was called Muelle Grande because of its construction, as this replaced a small dock that was in the area. The creation of this pier facilitated the loading and unloading of ships, which allowed an impressive growth of commerce in Costa Rica, this pier was one of the main sources of employment between 1929 and 1981 for Costa Ricans. This place is currently architectural heritage of the Puntarenas city, and is an important Tourist cruise pier in our country. 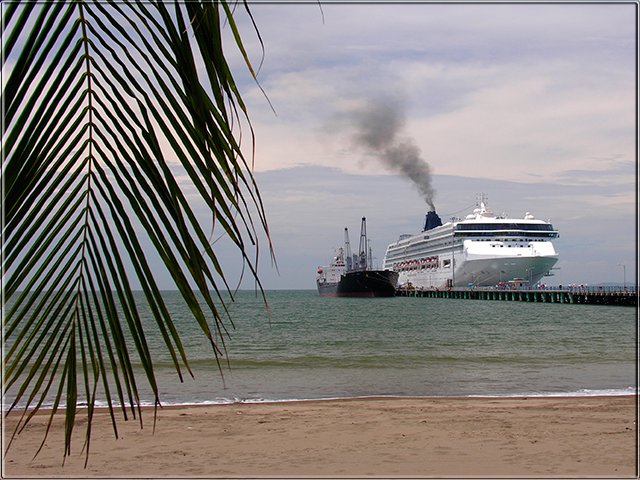 This park is located in Puntarenas city, 500 meters east of the Cruise ship pier, at the end of Paseo de los Turistas. In this park you will enjoy a sample of marine and coastal animals, and about 50 species wait for you in this place. In this park you will discover an aquarium, and an exhibition hall. You will also find animals from Costa Rican waters and others coming from international waters. You can see water species like nurse sharks, crocodiles, sea turtles and other animals, this experience will show you the beauty that the sea can offer. In the green areas of the park you will find picnic areas, a children?s pool (available from Friday to Sunday) and water games. Saturday and Sunday you can enjoy a fish bowl, where the visitors have contact with some species, and a restaurant, plus a great set of options that will make your stay more enjoyable. Visit this link Pacific Marine Park, and learn more about this magnificent place. This cathedral is the main religious center of the city, and is the major architectural Attraction, because it was designed with stones taken from Esparza and Barranca grain, and these stones were joined by a mixture of lime and sand, besides the floor was made of bricks. It is the only cathedral in our country with its main entrance to the east. This cathedral was declared a historical and architectural heritage of Costa Rica. Remember to be sure to visit this beauty architectural. Amphitheatre with capacity for 284 seated people. Historical Museum of Puntarenas City. Preserve, enrich and transmit the local and national culture. Provide training and education to people in the community. Introduce the story of Puntarenas. Coordinate cultural programs in the area. Provide to the community, cultural spaces to enjoy the city. This place is known as the Balneario de Puntarenas. San Lucas Beach Club opens its doors to the public from Tuesday to Sunday. There you can enjoy alone or with your family the pool area and facilities include changing rooms, ballroom, restaurant and two corporate rooms, for your enjoyment. This lighthouse was built years ago to guide ships coming from inside the gulf; today it is the bell tower of the virgin chapel Nuestra Señora Del Carmen. The old Captaincy of Puntarenas. Monument to the dockworker and Muelle Grande. The bulkheads (walls that protected the city from the strong waves). Remember, when you come to Costa Rica, do not forget to visit the Puntarenas city, and enjoy the beach, history, and many activities you can do, in this Pearl of the Pacific.